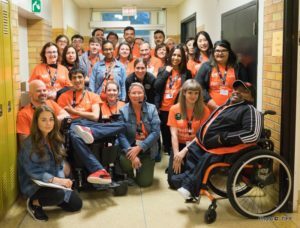 For many events, volunteers are the unsung frontline and behind-the-scenes heroes, and the Toronto International Film Festival (TIFF) volunteers are no exception. 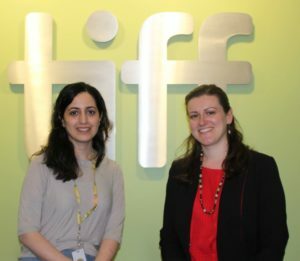 While there are hundreds of staff members that contribute to TIFF — from film selection to cinema ushering — it gives us great pleasure to highlight our volunteer programme. So put on your orange volunteer shirt and allow us to give you a glimpse into the world of “volunteerism” at TIFF! 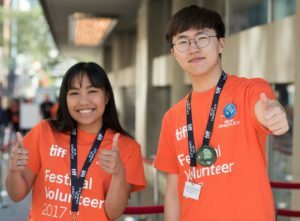 TIFF’s volunteer programme attracts the most attention during our main September Festival as we recruit, train, and supervise more than 3,000 volunteers. However, TIFF’s volunteer programme is also active year-round to help support the diverse programming and events offered at our headquarters, TIFF Bell Lightbox. TIFF also programmes and hosts three other film festivals throughout the year: the Canada’s Top Ten Film Festival, the TIFF Next Wave Film Festival, and the TIFF Kids International Film Festival. As a result, TIFF has full-time, permanent staff who comprise the Volunteer Resources department and manage the volunteer programme. We hire additional seasonal staff during the summer when September Festival planning ramps up. The timing of hiring seasonal staff is imperative to the successful management of the volunteer programme. We are fortunate to have a volunteer return rate of 60 per cent. The TIFF volunteer programme aims to provide support to the organization and helps to create meaningful experiences for our volunteers. Our volunteers support our programming and operational departments, and are active champions of our mission: to transform the way people see the world through film. A successful volunteer programme should also focus on understanding the event(s) it supports. Because volunteers support every department, our Volunteer Resources team must understand differing departmental goals and operations. A unique feature of the Festival is the number of venues we use — at least 11 on any given day — so Volunteer Resources staff must be familiar with the differing layouts and environment at each venue. Our screenings and events attract thousands of international visitors, so part of the customer service focus is on welcoming and informing visitors. Volunteer duties can be indoor or outdoor, during the day or night, and adequate preparation and resources are needed to ensure volunteers are engaged and supported. Recruiting volunteers for the Festival requires a significant amount of time, and staff prepare to open the online applications in late May/early June. We are fortunate to have a Festival volunteer return rate of 60 per cent and outreach begins early to potentially returning volunteers and our network of arts and culture organizations. Each volunteer role has been vetted and assessed for appropriateness and safety, and detailed position descriptions are created in consultation with other departments. We have specific guidelines for what constitutes a volunteer role, and these help to establish the responsibilities of the positions offered. Last year, the Volunteer Resources team scheduled around 20,000 volunteer shifts, making an electronic scheduling system vital to to plotting out volunteer shifts for all of our events. Seasoned staff members will recall that it was only a few years ago when schedules were entered manually in Excel documents, while some even remember handwritten schedules. Regardless of the type of system used, it must be appropriate for the size, scope, and potential future growth of the volunteer program. Our system allows volunteers to choose their own shifts based on their interests and skill set. As shifts are filled, the Volunteer Resources team updates the TIFF departments that have requested volunteer support. The Volunteer Resources team also trains TIFF staff who will be working with and supervising volunteers on how to work effectively with volunteers. We focus on keeping the lines of communication open with our volunteers as it can be a lengthy process from recruitment to the event itself. The Volunteer Resources team identifies key dates and expectations well in advance so that volunteers clearly understand the commitment required and the timelines. This is supported by our Volunteer Orientation Manual which is an integral part of informing returning and new volunteers. During the mandatory onsite orientation sessions, volunteers review the information in the manual. Returning volunteers complete their orientation online in the form of modules and videos to refresh their knowledge of TIFF and Festival operations. Utilizing online tools to diversify and improve the ways we orient and train volunteers has been a particular area of focus in recent years. The orientation sessions aim to set clear expectations of what volunteers can anticipate and experience onsite, and ensure that all volunteers have the framework to work through any unexpected changes that may arise. Volunteers are given role-specific training once deployed to their venue or event site. After the Festival, we send a survey to all volunteers and use the information we receive to improve the volunteer experience. Onsite supervision from TIFF staff is mandatory for all volunteer shifts, whether it is given by a Volunteer Captain (an experienced TIFF volunteer trained to take on a leadership role, acting as liaison between volunteers and TIFF staff) or TIFF staff member. Staff members must greet and sign in volunteers at a designated meeting location, be reachable for questions or escalation, and ensure that volunteers have what they need to be successful in their role. Volunteer Resources team members tour the Festival locations to check in on volunteers and staff, gather feedback on their performance and venue conditions, maintain a successful connection to the team of volunteers, and keep up morale throughout the expansive event footprint. This is why continuously checking in with the volunteers and staff and identifying any gaps in training, coaching, or expectations is an important part of the management and feedback process for the Volunteer Resources team. After the Festival, we send a survey to all volunteers and use the information we receive to improve the volunteer experience, from orientation and training, to schedules and the onsite experience. With all their outstanding contributions, we simply cannot thank our volunteers enough. They are our most enthusiastic, dedicated, and valued supporters and ambassadors. The primary piece of feedback we receive is that they enjoy being a part of the team, and that the experience they contribute to TIFF and the acknowledgment they receive is what brings them back year after year. TIFF is now accepting applications for its 2018 volunteer programme. For more information visit tiff.net/volunteer. We’re incredibly proud that the programme generates this kind of support from, and connection with, our volunteers. It’s a testament to the people who are attracted to volunteering and all of the work that the Volunteer Resources department puts into the programme. We provide learning and development opportunities for volunteers to enhance their skills and passion for volunteerism. Our hope is to empower volunteers to take on a more active role in future festivals and perhaps even become a Volunteer Captain themselves. In addition to offering vouchers to screenings for every completed shift, we organize social opportunities throughout the year, including preview screenings, trivia nights, and appreciation events. Letting our volunteers know how much their time, skills, and enthusiasm are appreciated is embraced by TIFF as an organization. Katy Fahimi-Manzari is TIFF Manager, Volunteer & Intern Resources, and is responsible for the overall recruitment, scheduling, and training strategy across TIFF’s festival and year-round volunteer and intern programmes. Danielle Gaudet is TIFF Senior Manager, Event Production, and oversees event logistics and production elements of TIFF’s festivals and programming.